Equations below the diagram show the derivation of the Sun’s luminosity—its total power output—from its surface temperature (Ts) and size (Rs) using the Stefan-Boltzmann Law. At its surface, the sun gives off 3.9 x 1026 watts—one very bright bulb! The next equation shows how this power is diluted by distance as this “bubble” of energy expands outward from the Sun. The power density at the surface of a bubble the radius of the Earth’s orbit is measured in watts per square meter; it is known as the Solar Constant, and is calculated at 1380 W/m2. Earth (TE) of 280K. Pretty chilly for us warm-blooded humans! 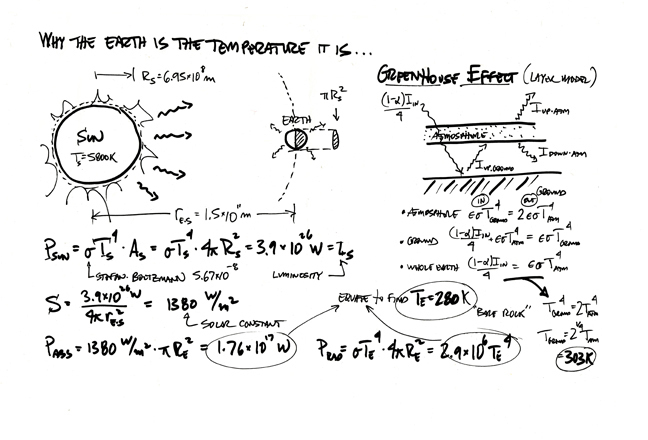 Fortunately, there’s the greenhouse effect. The Earth’s atmosphere acts like a thin layer of glass that reflects back some of the energy radiated by the Earth. Thus, the planet has two energy inputs—one from the Sun and one from the Earth itself—that combine to raise the temperature to a habitable 303K. Just about right—unless we mess with the reflective capacity of the atmosphere.